"John Lennon & Yoko Ono"
Other than Marvin Gaye's I Want To Come Home For Christmas, Happy Xmas (War Is Over) is the only seasonal Vietnam song from the 1970s. John Lennon and Yoko Ono share label credit with The Plastic Ono Band this time. The Harlem Community Choir that sings the lines "War is over if you want it," is featured on the record's picture sleeve. Two years before the record's release in December 1971, Lennon and Ono had rented billboards around the country stating "WAR IS OVER (if you want it)." With production help from Phil Spector they put their protest of the Vietnam War in song. The US release, Apple Records 1842, was issued exclusively on green vinyl and went to #3 on 'Billboard's' Christmas singles chart. It re-charted almost 25 years later at #32 on the Top Adult Contemporary chart. This time it was an album track from Capitol Record's 'Superstars of Christmas 1995.' And as wars continue, the song continues to get radio airplay every Christmas. The number of cover versions from Celine Dion to N’Sync attest to its enduring popularity. 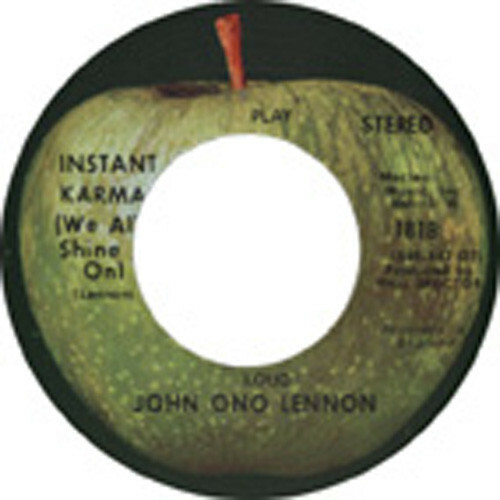 Customer evaluation for "Instant Karma - Who Has Seen The Wind 7inch, 45rpm, CS"